Linda G. Morris will be in conversation with John H. Morris, Jr., Esq., and Sidney Rauls-Ellis, LSWC. Before Opie lived in Mayberry, Beaver and Wally in Mayfield, and Betty, Bud and Kathy in Springfield, there were thousands of little Black children experiencing the same quality of life in Cherry Hill, a post WWII planned suburban community containing a public housing project on a southeastern peninsula of Baltimore City. 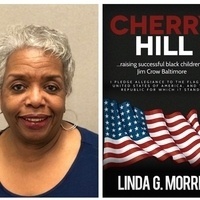 In Cherry Hill: Raising Successful Black Children in Jim Crow Baltimore, Linda G. Morris shares what life was like to grow up in a special place and time. Linda G. Morris was born and raised in Baltimore, MD. She attended Baltimore City Public Schools, including Cherry Hill Elementary School #159, Garrison Jr. High School, and Edmondson High School. She began freelance writing in the mid-1970s; her work appearing in Essence and Baltimore Magazine. Linda now resides in Germantown, Maryland, a suburb of Washington, DC.